Renting a motorbike is a common thing to do in this area as the ride from Hue to Hoi An is a popular drive because Top Gear made it famous. I could rent a bike here then drop it off in Hoi An, which saved me from driving it back and they take your bag, kind of as a guarantee. I decided to drive to Da Nang and have a night there. First, I cruised out to Thuan An beach and followed the coast road through small fishing villages and cemeteries all the way down to Cua Tu Hien where I crossed the new bridge and turn right to follow the road to take you down to Highway 1. Unfortunately, there were road works on this road so swerving pass pot holes and slow truck was part of the journey. At the Highway, I toik a left and started my ascent of the Phuoc Tuong Pass before following a straight stretch of Highway, where I came to the Phu Gia Pass. As I descended on the other side of this pass I saw some beautiful views out of Lang Co.
Once I passed through Lang Co, I started my ride up the legendary Hai Van Pass. The views were a little disappointing but I think it was due to the fog. At the top, there were old lookout turrets used by both the French and the Americans in war time. 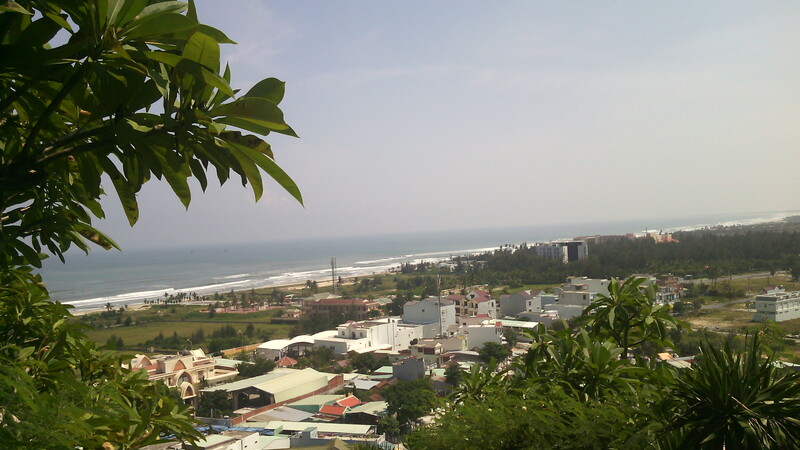 Then I glided down the other side into Da Nang. It took several hours so by the time I got there, I hit rush hour traffic, which is just insane but an exhilarating experience. Weaving in and out trying not to crash or get hit by any other vehicle. The hostel recommended this fish noodle soup for dinner and then I ventured out at night to see the neon dragon bridge and the colourful skyline, which looked beautiful in the river’s reflection. As I was trying to sleep a Korean guy came in to share the dorm and he just wanted to chat to me. Then these two others were placed in the same dorm late at night, who were making a huge racket. It was so frustrating. Waking up to my alarm, I went to have the hostel’s Vietnamese breakfast: red, gooey rice (a little like hot rice pudding) and fresh fish piece. One bite and I put down my spoon. It was disgusting, not worth waking up for. After sleeping a little more, I motorbiked along Da Nang’s beaches, admiring the view and visiting the lady Buddha. On the route to Hoi An, I stopped for lunch then climbed Marble Mountain, which had several pagodas and temples to see as well as caves. Previous Hue, Vietnam: speciality food, blind massage and Citedal Next Hoi An, Vietnam: old town, lanterns, food, beach and bicycle rides. Sounds like you’re having a fantastic time whilst doing a worthy job teaching. God Bless you and keep you safe and well. Anne Banfield.